"Fleuisy Music" is the third solo album from Takahiro Kido, composer/member of Anoice. It seems as though we, as listeners of obscure music, still can't get over the hump that is the “new solo artist” bias. They don't have the flashy names, or the intriguing sense of mystery, or the well-known back catalog of works that more well-established bands have (when they have a back catalog at all). Bottom line – people are less likely to even read about a solo artist (check the page views on solo reviews versus other, comparably scored reviews if you don't believe me) let alone spend some time researching and experiencing the artist's work. I know I'm biased in this way – perhaps I'm the only one, although I doubt it. In any case, we need to struggle to overcome this bias against the solo artist, to work against this illogical block we place in the path of our musical exploration, for if we do not, we risk missing out on artists like Takahiro Kido. Kido's latest effort, Fleursy Music, is a stunning display of ambient/classical orchestration, deftly moving between the genres in order to create a kaleidoscopic vision of beauty. The balance between ambient-focused tracks and more classically aligned ones is struck perfectly, allowing variety to keep the listener's attention while avoiding the certain doom that is a lack of focus. As a member of Anoice, Kido proves time and again over the course of three quarters of an hour that working outside of the critically-acclaimed confines of the band has done nothing to hinder his ability to accomplish ambitious, powerful designs. If nothing else, working alone has allowed Kido to create music that is on the brighter end of the emotional spectrum – always a welcome sight in the melancholy-drenched world of instrumental music. Note that the album being more “happy” does not prevent it from satisfying the close listener – it is still a subtle, well-composed work, just not engineered to take you to a dark place, which is an effort I think we all can appreciate. Second track “Smile-Spotter Chronicle” demonstrates the sheer power of the more classical compositions on the release. A lovely piano melody ushers in the track, and is then slowly over taken by a soaring violin, while soft electronics work their subtle magic in the background. Soon, another violin launches itself into the mix, offering what would be considered a “release” on a post-rock track, but bringing the listener to ever-higher levels of joy rather than relieving tension. The careful sliding of the piano further back in the mix at the introduction of the second violin is testament to Kido's mastery of his craft – it is barely noticed, but it prevents the track from becoming cluttered and chaotic. It is a standout track if I've ever heard one, and the album's only just begun. “Christmas Song” works in a similar fashion, though shorter, and with a greater emphasis on electronics. One listen to either track will erase any doubts as to Kido's skill at classical composition. If those tracks aren't enough for you, why not give the fantastically soothing guitar of “Milk Tea” a try? Or perhaps the more ambient, chill-out rhythms of “Poco!” are more to your taste? In any case, there is so much to love on this little album that it would be a crime to avoid it. Fleursy Music is probably the best ambient release so far this year, and will be a tough act for future ambient artists to follow. If you have ever needed solid evidence to conquer your biases, here it is – Takahiro Kido shows that the solo artist should be given just as much credence as any other band. Don't let your biases overwhelm your curiosity – listen to this album. You will be glad you did. Magia del casalingo e delle piccole cose, accessi di malinconia, transitori stati di grazia e trascurabili epifanie quotidianeŠ Ovvero ciò che davvero conta nella vita, una volta che non ci si aspetta più grandi rivoluzioni ed eventi memorabili. Ed è la cifra che accomuna i partecipanti alla bella compilation dell'etichetta nipponica Flau, recante appunto la programmatica titolazione in esergo. Allora forse poco contano i contributi dei singoli (sebbene vi si trovino pagine più avvincenti di altre, citiamo in fila Jasper Leyland, Patten, PoPoyans, Part Timer, F.S. Blumm e Luca Fadda, Marla Hansen, Cokiyu), perché è l'immagine complessiva a dare il peso specifico dell'opera, deliziose (elettro)acusticherie in chiave di pop povero, giocattolini malconci, aria distratta e casuale, occhi spalancati sul mondo con lo stupore di un bambino. In linea la sezione video con girato di Iris Piers e musiche di Aus, artigianale panoramica minima(lista) d'ambiente domestico. Se all'attitudine crepuscolare di cui sopra aggiungete una passione sfegatata per la Penguin Cafe Orchestra, come solo la si può coltivare nelle terre d'estremo oriente, avrete un quadro più o meno calzante della musica di Takahiro Kido. Già coinvolto in numerosi progetti collettivi (Anoice, Cru, Mokyow), in questo lavoro solista l'autore di Tokyo pennella paesaggi di squisita delicatezza semi-acustica, tratteggi di pianoforte, violino, flauto, violoncello, fisarmonica, glockenspiel etc. la cui registrazione avviene in luoghi insoliti (all'aperto, in tunnel sotterranei o edifici abbandonati) per sfruttare a dovere le riverberazioni naturali, e poi stratificare per via digitale e con intervento quanto mai parco e misurato il materiale così ottenuto. E sono gentili colonne sonore per pigri pomeriggi trascorsi a interrogarsi sull'incanto di un fiocco di neve o di una nuvola passeggera. Now and again you stumble on a release that is so beautiful that you find yourself playing it on for days on end. Such is the case with Fleursy Music, which is as blissed-out as a record can get and has led me, right from the opening bars of Y’s calming guitar strum to Goodbye’s ghostly fairground noises, to spend hours in a state of suspended animation. The piano–led tracks on here are especially wonderful. A good example is Smile Spotter Chronicle which revolves slowly round a drowsy keyboard riff and builds up (with the aid of violin and guitar) to a gratifyingly full conclusion after nine minutes or so. I’m sorry but mention of Moebius/Rodelius can never be far away in a review of a release such as this; (Poco!’s naïve chiming being reminiscent of something off Sowiesoso) but never let that be seen as a bad thing. The LP really starts to hit its stride from Milk Tea, which a sublime web of acoustic guitar sampling. You Lost What? is a brief interlude of harmonious sounds before Landscape with Snow’s “lonely piano in a ballroom” schmaltz obliterates everything in it’s path, and The Gentle Afternoon’s reflective meanderings offer no way back for listeners strung out by the aural caress of Landscape with Snow. Great stuff. An essential album for summer and autumn listening. 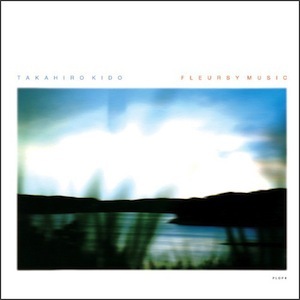 "Flower-ish" (absolutely not "flowery") music - "fleursy" is Takahiro Kido´s own coinage, but the neologism kind of rings wrong and sounds like a respiratory illness brought on by contact with flora. The music itself has quite the opposite effect, tearing down the walls of hipness and irony that usually protect us from caring about anything too much and inviting us to enjoy this lovely pastoral chamber music as we would a beautiful day. Dreamy melodies are picked out on acoustic guitar or piano and then often filled out with strings, organ or the occasional accordion. Even the ringing electric guitar that joins in on "Smile-Spotter Chronicle" blends right in. There is something of an old-fashioned good time about Fleursy Music, like a country fair (and in fact, the coda "Good-bye..." features a slightly off-kilter midway calliope). A time of more innocence and less electronic squealing and beeping. And the music bears a distinct whiff of springtime turning into summer. Where the piano takes prominence the mood may be a bit more elegiac, when it is accompanied by a simple, crunchy, programmed drumbeat is becomes more down-to-earth and smile-inducing, as on "Milk Tea". Throughout, Kido has something profound to say about simplicity, but never raises the music´s voice. Apparently, the ten tracks which appear on this album were selected from an archive of over one hundred and fifty, so we should not have long to wait for more - perhaps much more.